A helicopter drops water as an aerial view shows smoke from forest fires in northern Ukraine, Apr. 28. Ukraine's emergency services appealed for calm Wednesday as wildfires raged in the exclusion zone surrounding the Chernobyl nuclear power plant in Ukraine that went into meltdown in 1986. "Levels of background radiation are normal … don't panic! 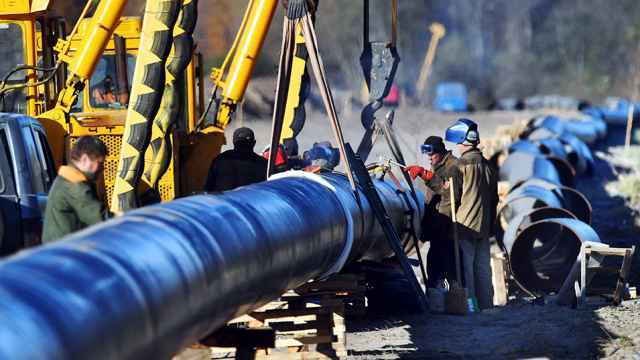 Everything is in order," Ukrainian emergency services head Zoryan Shkiryak was cited by Russian media as saying, adding "the situation is 100 percent under control." A 30 kilometer radius around the old power plant marks the exclusion zone, an area in which parts of land exceed the International Atomic Energy Agency's radioactive contamination standard. Ukrainian Prime Minister Arseniy Yatsenyuk said the blaze was under control and had been contained to an area 20 kilometers from the plant, The Associated Press reported. 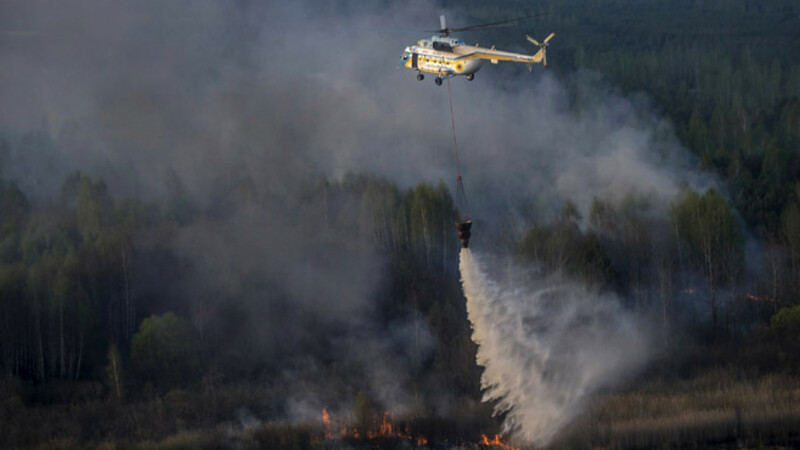 Environmental organization Greenpeace on Wednesday expressed concern that the Ukrainian government could be downplaying the extent of the fire. The AP cited officials as saying the blaze had swept through 400 hectares (1.5 square miles) of woodland on Tuesday. Greenpeace said in a statement that the affected area — including woodland, drained peat bogs and fields — extended some 10,000 hectares. Sunday marked the 29th anniversary of the Chernobyl disaster that caused the premature deaths of at least 28 people from acute radiation sickness, increased the incidence of cancers in areas of today's Ukraine and Belarus and contaminated vast areas of land, according to the UNSCEAR report on the accident. Scientist Nikolaos Evangeliou, author of the 2014 paper "Wildfires in Chernobyl-contaminated forests and risks to the population and the environment: A new nuclear disaster about to happen?" told The Moscow Times on Wednesday that "the [radiation] risk for the general population is negligible." Evangeliou said reports suggested that the fires were only affecting a small area of the exclusion zone and that they were far from the most highly contaminated areas. The only people whose health is potentially at risk as a result of the radiation in this fire are the firefighters and anyone else inhaling the smoke at the site of the fire, Evangeliou said. Evangeliou's model shows that dangerous levels of radiation — high enough to induce cancers in the general population — could spread across Europe, particularly Ukraine, Belarus and parts of Western Russia, if the entire Chernobyl exclusion zone were on fire. A combination of increasing periods of drought and a lack of funding to prevent and fight fires in the exclusion zone — now 70 percent forest — means Evangeliou's worst-case-scenario model may not be so extreme in the years to come. 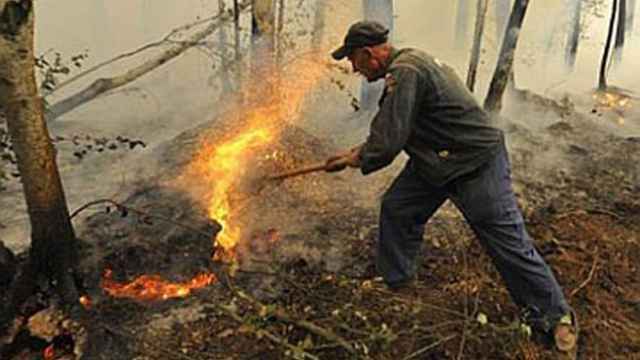 "Chernobyl forest staff, including firefighters, have been cut by almost 40 percent during the past two decades … and half of the wildfires usually occur outside the [fire] detection radius," Evangeliou wrote in a 2015 report, adding "only 20–30 percent of the required prevention measures in the CEZ [Chernobyl exclusion zone] are executed annually due to lack of funding." The report also expresses concern over the "dramatic reduction of the forest road network available for fire engines" in the exclusion zone, rendering many areas virtually inaccessible to firefighters. Greenpeace forestry expert Alexei Yaroshenko told The Moscow Times earlier this month that the Bryansk region in western Russia had been badly contaminated as a result of the Chernobyl meltdown. Two scientists from Moscow State University — Alexei Shcheglov and Olga Tsvetnova — who studied contaminated areas of Russian soil for nearly three decades following the Chernobyl disaster told The Moscow Times that now "the risk of [radioactive] contamination spreading as a result of wildfires is significantly less than it was in the beginning  because most of the radioactive material has sunk to the mineral layers of the soil which, as a rule, do not burn during fires."